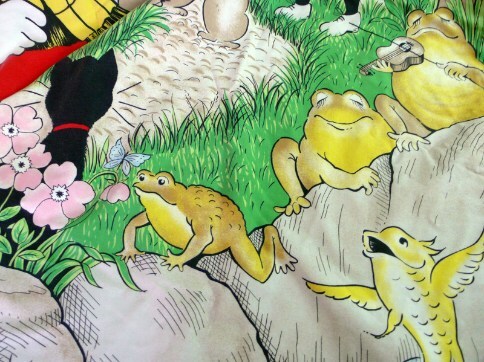 This lovely Rupert duvet set dates from 1986 and has a large printed picture of Rupert pointing to kite on the front. 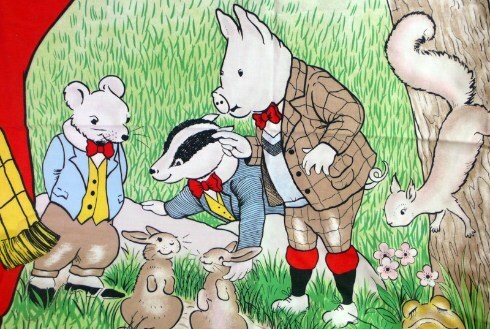 The scene is beautifully detailed with a castle and various animals and plants plus most of Rupert's Nutwood chums. Everyone is here, from Algy to the talking fish! What makes this set stand out is the reverse. This is usually a plain yellow polycotton but this cover is reversible with Rupert Bear story panels filling the other side of the duvet cover. There is a matching pillowcase which is a softer fabric than the cover and gently faded. It has the same image on both sides. The duvet cover is a single size and fastens with poppers. It is in excellent condition with bright colours and a crisp feel to the fabric. There is no fading and no marks. These Rupert duvet sets were originally made by Hamilton Mcbride and show the original, Daily Express, Rupert the Bear drawings. It is marked with the Express Newspapers Copyright dated 1896. I've never come across this version before.